Recently refurbished condominium located in Canada's oldest Chinatown. Enter into a bygone era that combines luxurious heritage space with sleek new modern amenities. Walk on vertical grain fir wood floors, through the heritage stained glass door and window facade and out to the balcony above Fisgard street. Sit and enjoy the atmosphere of China Town while admiring the luscious red glow of swaying chinese lanterns spanning the city street. Perfectly central, this location has the best walkability score in Victoria. You are in the heart of great restaurants, shopping and microbreweries. Park your car and leave it. This elegant condo is perfect for maximizing your time in Victoria and will be the highlight of your stay. Please note: As of January 15th, 2019 there is NOW PARKING INCLUDED with the rental of this unit. Parking will be made available to you once you have checked in. Suite allocated parking is located approximately two blocks away from Fisgard Street. Occupants use the dedicated parking at their own risk. Shane owns this space, but expect to contact Paula, who helps cohost with him while he is away. Shane is a native of Victoria, and splits his time between family in Canada and his work in LA. He understands what makes a great get away location and this is why he purchased this one of a kind property. Paula lives in Victoria and also Owns in the Lum Sam - Lee Chong development. This condo blends the old and the new with elegance. 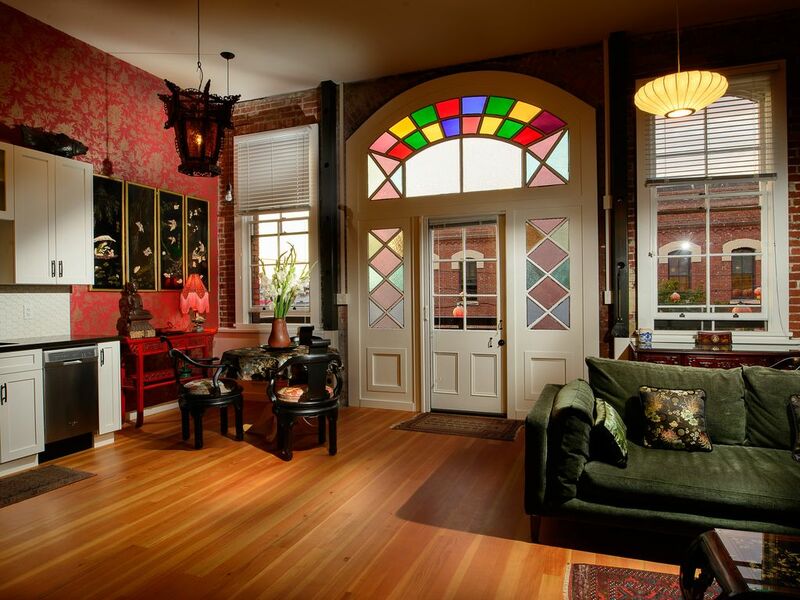 Heritage exposed brick, original stained glass facade, 13' ceilings and 700 square feet of floor space - it is a truly unique space and nothing compares to it in Victoria. Thats why it is A Jewel that we can all share. The location is truly unbeatable. Close to the Inner Harbour, the Gorge Inlet, the positioning makes it suitable for both those that like to take things a little slower or those that are more adventurous at heart. Go kayaking, or Stand Up Paddle Boarding with rental available from Ocean River at the ned of the street and explore the inner harbour from the water. Paddle under the Blue Bridge and dodge Sea Planes taxing in and out of Canada's second busiest water airport. Paddle over to Fishermans Wharf and enjoy some ice-cream, watch the seals and tour the inner harbour back. For this land lubber types, you can also stroll through the inner harbour, sit and watch the float planes come in and out, stroll along Laurel Point along the harbour and end up at Fishermans Wharf on foot. Feel like Whale watching or taking a tour on a pickle boat of all the fantastic harbour side pubs? Why not try High Tea at the Empress Hotel or stroll around the Legislature Gardens? You can walk to all of this and more from the Jewel. toilet, combination tub/shower, Hand made Salt Spring Island liquid soap for your enjoyment! The bathroom has liquid soap, shampoo and conditioner dispensers. The are large soaker tubs that you can enjoy hot baths ins. A hair dryer is available. Extra towels are in the hallway closet. Close to the inner harbour of Victoria. A slide insect screen is installed on the balcony door. Open the balcony door for continued air flow. Wall mounted electric forced fan and electric baseboard heaters are thermostat controlled on the wall. Detergent in the hall cupboard. Washer and dryer stacker in the hall closet closest to the front door. Soap pods for dishes located under the kitchen sink. Fridge and stacker freezer - wine ready. Located above the stove with exhaust fan and light for task lighting during cooking. Plates, pots and pans, glasses, etc. Plates, pots, pans, knives and forks, kettle, toaster. All you need to make a meal. Turn of the century restored Chinese carved wood chairs. These chairs are covered in silk fabric covered cushions and rotate just like a lazy susanne table. Full length balcony fronting onto Fisgard street. My husband and I really enjoyed our weekend - great location and the condo is so beautiful! I really like Chinatown and it felt like a special get-away to be completely immersed in it, from the stunning condo decor, to easy convenient access to the best food in town (in my opinion). I loved seeing the red lanterns from Chinatown lighting the inside of the condo at night. For a downtown location, it was quiet too! Access to the condo was easy and I loved the inner alleyway of the complex. Paula was a super-host and answered questions and provided information as needed. Beautiful well appointed bnb. Great location, good service. We enjoyed our stay in The Jewel. Comfortable bed, modern appliances and well suited for a longer stay. No problem checking in and in the heart of Chinatown so good walking distances to major attractions. Minor problem with internet was addressed promptly by Paula. Double set of stairs may pose challenge for those with mobility problems. All in all we thoroughly enjoyed our stay. Suggest that a TV schedule be provided for out of towners. Stylish unit which ideally located in Chinatown and on the boundary of the busier and noisier downtown core. Easy walking to anywhere and great access to nearby walking paths, downtown and the inner harbor. Wonderful restaurants nearby (Bao, Fishhook and Grave sushi to name a few) with ambiance of oldest Chinatown on Canada (small area so none of the noise you experience with larger Chinatown's). The unit is clean, functional and has most amenities that one would need for our short stay. Excellent and relaxing. Easy to access and close to everything! Was very quiet and comfy . We stayed here over Labor Day weekend and enjoyed every minute of it! It has a terrific deck overlooking the Chinatown district. We took a water taxi from the ferry and it dropped us off 2 blocks away. Everything is within a short walking distance! The place was adorable, extremely clean and comfortable. Only thing missing was a coffee pot, but literally right underneath the deck was a great coffee shop. Enjoy!! Also, owner was very responsive and even though I worried about the keypad access it was a breeze!